As mentioned I got some woodworking in last night. I put the last coat of shellac on, and then paste waxed the structure for the first of two bedside tables that I'm making for us. My first time using either of those finishes, pretty happy with the result. 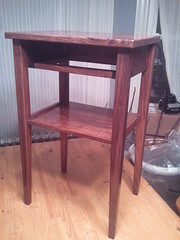 They're quick dirty cameraphone shots, I'll do a nice shoot once I actually build the drawer for it. I've been woodworking off and on for many years now, but this is the first piece of solid hardwood furniture I've ever made. I only see the flaws of course, but I'm pretty satisfied to have done it none the less. That looks lovely to me! The legs are tapered from the lower shelf to the floor. That's one of my gripes actually, I couldn't quite get nice clean cuts at the start of the tapers. I have plans for a jig to let me do it better on the next one. Oh yes... jigging plans... mwuahahaha! It's looking great! From these pictures, I can't see the flaws. Looks handsome to me. The tapering (and the grain) are the first things I noticed. I love the finish you chose and it's a beautiful color. sweet! can't wait to see more details. Congrats on accomplishment. those moments of "holy crap, it's moved into another sector of my to-do sheet" can be amazingly restorative.